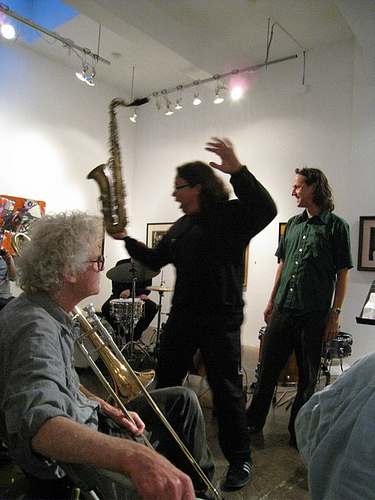 Despite being extremely tired from a major event as well as a rehearsal this past weekend, I did manage to catch a performance of jazz and improvisational antics at Berkeley Arts this Sunday evening. The evening opened with Base 4, a jazz trio featuring Bruce Friedman on trumpet, Derek Bomback on guitar, and Alan Cook on drums and percussion. They performed very abstract versions of standards, including Afro Blue and Solar, two favorites of mine. There was also free improvisation and some lesser-known compositions. It was a technically strong performance, a full of creative details. Then we switched rooms for a completely different experience with the “Bay Area Improvising Tag Team Ensemble.” Not really an ensemble, this cast of characters assembled by Moe! Staiano performed free improvisation “refereed” by Gino Robair. Basically, performers were given signals of when to start and stop, and could within that context tag one another to play together and switch instruments. There were, however, penalties that could be levied against performers. A penalty meant holding a can of motor oil and not playing until it lapsed or another penalty was committed. As with sporting events, one could find disagreement with the referee. In this case, I strongly disagreed with Gino’s giving Polly Moller a penalty for using a wah-wah pedal. We at CatSynth approve of wah-wah pedals. Here are some other scenes from the evening’s performance. We begin with Matt Davignon on turntable and Moe! Staiano on drums. Bandmates Polly Moller (Reconnaissance Fly) and Melne Murphy (Surplus 1980). Mark Clifford and Kyle Bruckmann. Mark does not usually play bass. Brian Tester and Yacob Roli Glowniss. Rounding out the ensemble for the evening were Dominique Leone, Jacob Felix Heule, Jason Hoopes, and others who I have missed. Overall it was a lot of fun to watch, especially when things got more rhythmical or when a penalty was eminent. The performers who I talked to seem to have a lot of fun as well. The concert series of the Outsound Music Summit began this Wednesday with Sonic Poetry, a night combining poetry and live improvised music. This was a first for the summit, with three leading Bay Area poets collaborating with local improvising musicians. Each of the sets featured a different style of poetry, which was reflected in the music and performances. 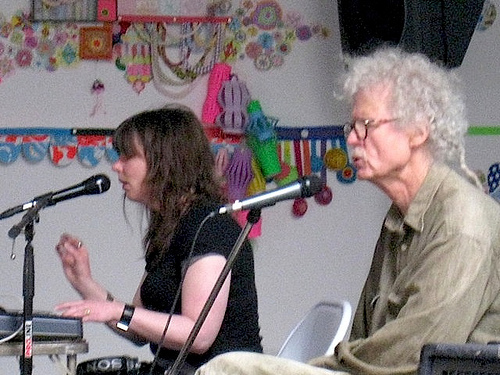 The first set featured Ronald Sauer, a leading figure in the North Beach poetry scene. His poetry was infused with social satire and provocative imagery, and his reading style had that driving tumbling-forward energy reminiscent of earlier poets of that scene. In this performance he was joined by percussionists Jacob Felix Huele and Jordan Glenn. The next set was a duo featuring poet and performer rAmu Aki with musician Karl Evangelista on guitar and electronics. 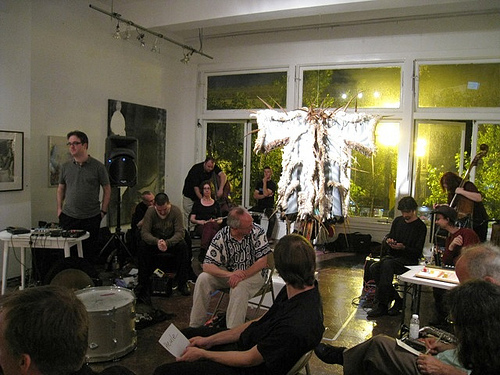 rAmu Aki’s poetry is deeply rooted in the landscape and culture of San Francisco’s Tenderloin (“TL”) neighborhood where he lives, and by his own declaration was inspired “by the voices inside his head.” He also wore an impressive blue feathered headdress. Alongside Aki’s fast rhythmic words, Evangelista began with an anxious chromatic guitar line. 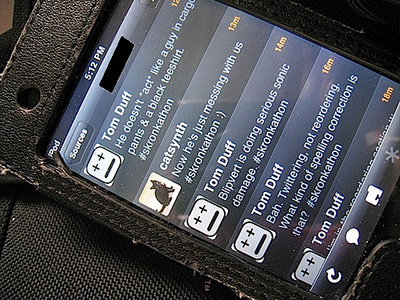 Phrases like “City of Light” and “English Harassment” were followed by sounds with distortion and other effects, and looping to produce contrapuntal textures. The poetry was full of references to the Tenderloin, some of which like the street names, were familiar, others less so. There were light chords against angrier words, surf tone and more distorted guitar moaning. During a break, there was a rather pretty guitar solo on top of which followed a gentler and prettier poem. A jazzier and more rhythmic section of music accompanied the poem “Grove and Laguna Sunset.” Overall, the duo has a strong musical rapport, with rhythmically tight starts and stops to phrases, and pauses that allowed the music to come through clearly. The final set featured poet Carla Haryman and musician John Raskin on saxophone and other instruments, joined by Gino Robair on percussion and prepared piano. Unlike the other collaborations in this concert, Haryman and Raskin have worked together for a while, and I was quite looking forward to hearing their performance. My experience with poetry is that it tends to be far denser than standard language. As such, it can be a challenge to listen to in sets that are 30 minutes long or more. 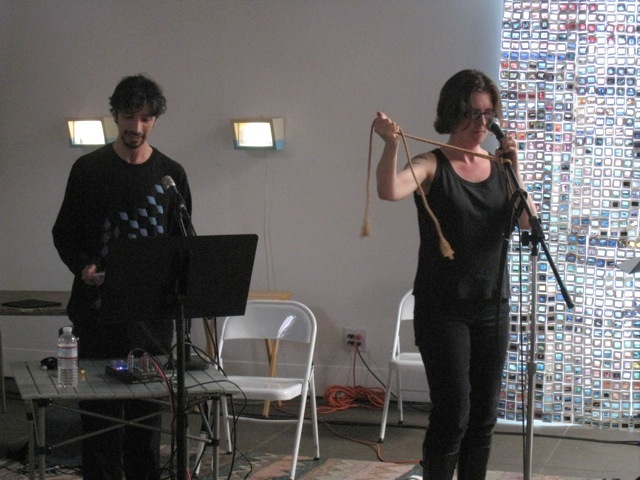 The rhythmic musicality and phrasing employed by rAmu Aki and the sparse abstract texture of Carla Haryman’s poetry made them work particularly well in the longer setting of a musical performance. The evening was well attended, with many unfamiliar faces who followed the work of the featured poets but may have been experiencing new-music concerts for the first time. Overall, it was a very strong and dynamic opening concert for the Summit. It is mid-summer, and so once again the annual Transbay Skronkathon and BBQ comes around, with a full day of experimental and weird music at 21 Grand in Oakland. There are always a few from outside the Bay Area, or who are appearing in this setting for the first time, but overall it is a who’s who of local experimental and avant-guard musicians and familiar faces. We spend the whole day performing and listening to music, and dining on a variety of grilled food items in the neighboring alley. I arrived at 4PM, which was already three hours into the event. 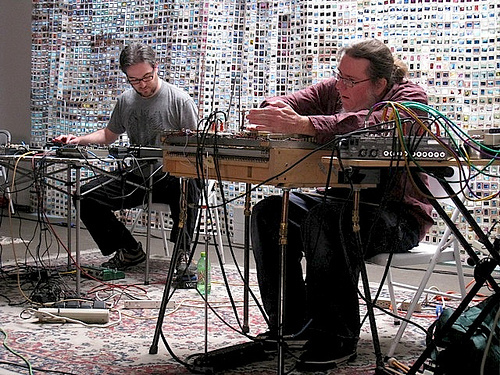 I was just in time to catch most of Respectable Citizen, a duo of Bruce Bennett and Michael Zbyszynski performing live improvisation with keyboard/electronics and saxophone, respectively. 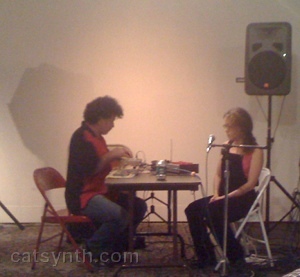 The set started with ethereal noisy computer sounds in the background, with the noises increasingly insistent and louder over time, culminating in a defined whistle sound and a wave that became something akin to electrical noise. The electronics were complemented by the saxophone improvisation; there was a moment where the sax and electronics together formed a sound like an emergency siren. Then things became quiet again with the noise growing into an ever louder rumble. Next was electric-guitar looping performance by George Ludwig. 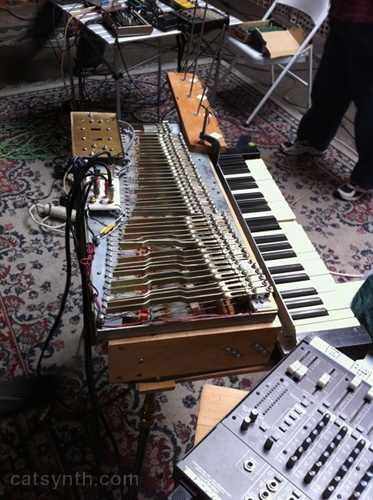 It was very similar to the looping guitar performances I hear annually at the Live Looping Festival in Santa Cruz, with drones and long tones; mostly harmonic, though there was some good clean distortion effects as well. I made sure to be in for the next group, T.D. 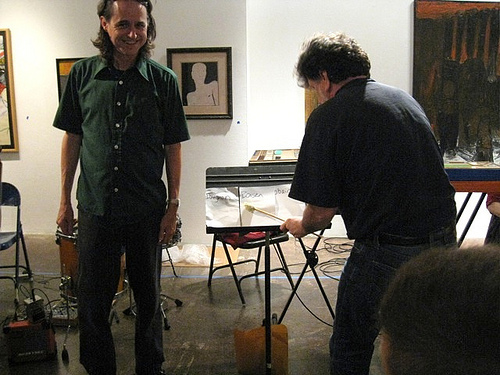 Skatchit, featuring Tom Nunn and David Michalak on custom instruments called skatch boxes. I had just seen Nunn and his custom instruments at the “Tuesdays at Toms” performance. 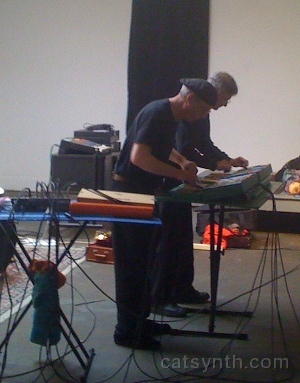 This performance featured similar instruments, made primarily of cardboard and performed with combs and other implements. The result is a series of scratches, streches, scrapes, squeaks and other noises, all very musical. With two performances and multiple instruments, harmonies start to form. Even when not looking directly at the performers (which is quite interesting to do), the performance had a very “visual” quality. The overall texture reminded me of the sounds of the woods at night. I could hear scampering mechanical creatures. Although the structure of the music was very static, the performance was very expressive. Jay Korber (tenor sax). This set qualified as actual “skronking”, with very rapid notes (especially on the drums) and the belting of inharmonic and variable pitch tones on the sax. Lots of details to listen to. But above all, skronking tends to be very loud, so I did end up listening to second part of the set from the alley, where I also had a chance to socialize and check out the barbecue. However, the loudest set of all was yet to come, and it wasn’t even officially on the program. Someone in a ski mask with a table-saw on an old turntable record player claimed to be the next set Sndrft eeoo, though it turned out he wasn’t. Nonetheless, we were treated to ear-threateningly loud high-pitched noises that sent everyone out into the alley to join those of us already there for conversation and sausages (the official food of choice at the Skronkathon). Outside, the sound was somewhat bearable, and vaguely interesting. Sndrft eeoo and Mike Jacobs did get to play an abbreviated set once the impostor left the stage (much to our collective relief). noise, mayhem, and roaring silence. He was introduced by Tom Duff as playing “a big pile of junk” – but a nonetheless musical pile of junk. He started with stones and bass drum, making rhythms. He then moved to to bins and metal objects, all the while maintaining a basic rhythm. He bashed in a large plastic bottle really good. There were also some electronic circuit-bent toys, and a toy piano (acoustic toy piano being an instrument I am quite fond of). As the toys came to the forefront, the rhythm began to break down and the texture more sparse. From loud skronking and found objects, we then had a very contrasting set from Protea, with Serena Toxicat and thereminist Joey D’Kaye performing ambient electronic music. Sporting a Hello Kitty tunic, Serena Toxicat gave an evocative performance with vocals and dancing . 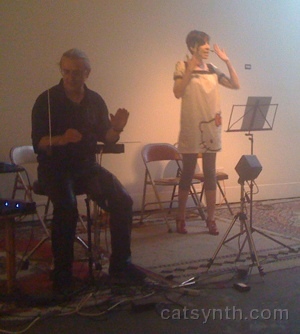 The vocals and theremin both consisted of long tones that followed one another without exactly matching. Overall, there were minor harmonies, etherial textures, gradual changes and a bit of tension. We then switched back from ambient electronic to skronking (but it is really “skronking”?) with a free-improvisation set by z bug with David Leikam, Zachary Morris, Sheila Bosco and Craig Latta. Once again, lots of fast loud notes, with the bass acting as a third drum set (there were two drum sets in this group), and some performance with a Moog synth. Although the set was very loud at times, there was really a good range with sudden drops in volume where one could here bells and chimes sounding. However, I could not at all hear the vocals. I did like the sudden switch during the performance to a steady disco beat. Tom Nunn and David Michalak returned as part of RTD3. Overall, the performance was similar to their set the previous tuesday, with Nunn and Michalak performing free improvisation together Ron Heglin on trombone and Doug Carrol on electric cello. 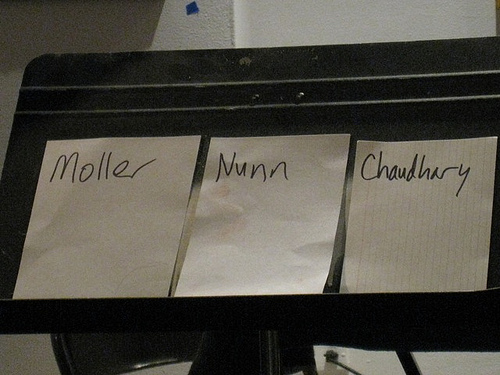 However, Nunn’s instrument in this set was quite different. It was a much larger board that he played vertically. It looked a bit like a modernist painting with some elements that seemed derivative of Kandinsky, but it had a very clearly marked eye and geometric shapes. The texture of music was more sparsem and there was a good moment with soft trombone. it sounded like “a radio from the past.” There was a section that sounded vaguely ethnic (in the way that a contemporary western audience might label some music as “ethnic”) and then hit a watery pattern on Nunn’s instrument. 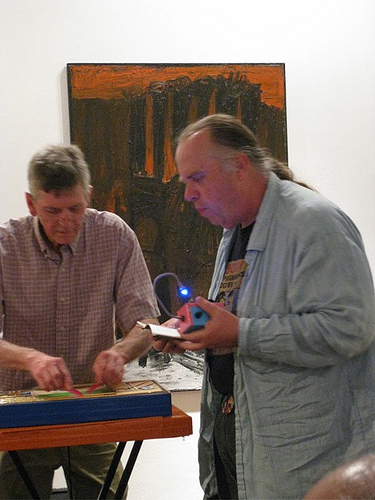 John Hanes and Steve Adams performed “dueling laptops” (and an iPhone). Moments in the music reminded me a bit of one of my favorite Stockhausen recordings, but there were also drums and beats, timbrally rich drones and bowed tones and loops. It reminded me a bit of the “Off-ICMC” concerts (often the more interesting performances) I would hear when I used to attend the computer-music conferences. I did not get to hear as much of PG13 in detail as I would have liked because I was busy setting up for our upcoming set. 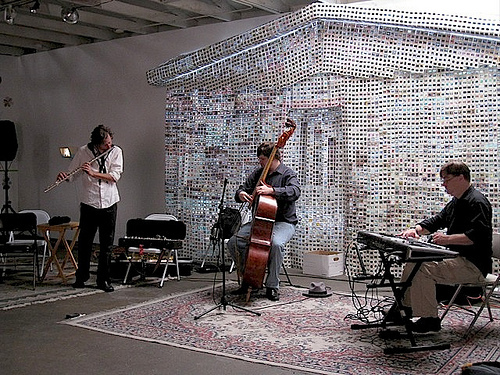 The trio consisted of Phillip Greenlief on saxophone, John Shiurba on guitar and Thomas Scandura on drums. It seemed during the introduction that there was some question as to whether they should be described as “1970s rock” or not, but musically they did have a strong driving 4/4 beat with heavy drums and loud guitar. Greenlief also played very rhythmic accented lines on the saxophone that fit with the guitar and drums. So with my only partial listening, it did have a lot of “rock-like” elements, which were welcome, and a good lead in to our own set. 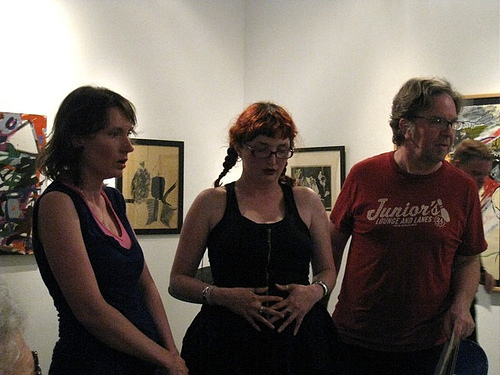 This was our first time performing re-named as Reconnaissance Fly and as a trio rather than a quartet, with myself, Polly Moller (flute, voice, heatsink) and Bill Wolter (guitar, custom electro-mechanical “boat”). We are currently looking for a bassist/composer to round things out. The set consisted of four pieces based on “spoetry” or poetry found in spam emails – most email spam (or blog-comment spam) is completely worthless text, but occasionally there are very poetic passages that can be used for creative work. I did two pieces setting spoetry to graphical scores in which the performers improvised based on interpretations of graphical elements, and Polly and Bill each did more idiomatic pieces. All the practicing and rehearsing paid off, and the set was quite tight and full of energy, with fun and theatrics – and I’m glad I brought the full keyboard for playing more traditional jazz piano at various spots alongside the more esoteric electronic sounds from the Kaos pad. Probably the most memorable moments were repeated riffs on “Ca-a-na-da-a”, and the rolling jazz bass and guitar in “Emir Scamp Budge”. And it seemed like we had a pretty decent audience. Matt Ingalls, Christopher Jones, and John Ingle) sometimes match the percussion (Kjell Nordeson) , sometimes the strings (Alexa Beattie, Monica Scott). The performance was very subtle with lots of dynamic range and empty spots, and quite a contrast to our set with its loud electronic improvisations and theatrics. sfSound was immediately followed by another powerful accoustic set, featuring Karen Stackpole with her impressive array of gongs, Jen Baker and Ron Heglin on trombones, and Tom Djll on trumpet. An unusual instrumentation, “Brass and Bronze” (as introduced by Tom Duff). The set began with the gongs followed by really soft long notes on the three brass instruments. The gongs resonated as Stackpole moved along their perimeters, producing beautiful long stretched out tones. They formed inharmonic chords anchored by drones on the brass. The texture became less sparse over time with bowing of gong and faster swells on trombone and notes on trumpet. This eventually turned to loud hits and gong strikes, and more expresive phrases. The final set of the Skronkathon featured Gino Robair and Amy X Neuburg on dueling Blippo Boxes. The Blippo Box is a custom analog synthesizer by Rob Hordijk that features chaotic oscillators and a wide range of non-linear modulation options – I wouldn’t mind having one of these myself. 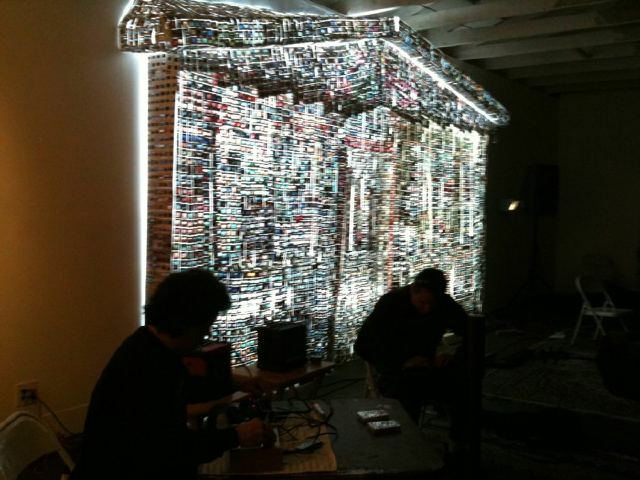 The Blippo Boxes produce constantly modulating sounds that are difficult to control in advance, the performer must react to whatever is produced using his or her best musically instincts. As the boxes can occasionally go unstable, being able to react quickly is key. Fortunately, we have two master musicians whose listening and improvisational instincts can be called upon to handle such situations. The result was a very expressive mixture of machine noise and rumbles, gargles, clicks and chirps – the chaotic sound actually becomes familiar after listening for a few minutes (though in fairness I should say years of listening to such music). And there were many moments where the oscillations of the two boxes seemed surprisingly on sync, with the waveforms and modulations slowing down to the level of musically distinct notes. And once the Blippo Boxes went silent, this marathon event came to a quiet end.